They’ve been a major attraction among researchers for years. 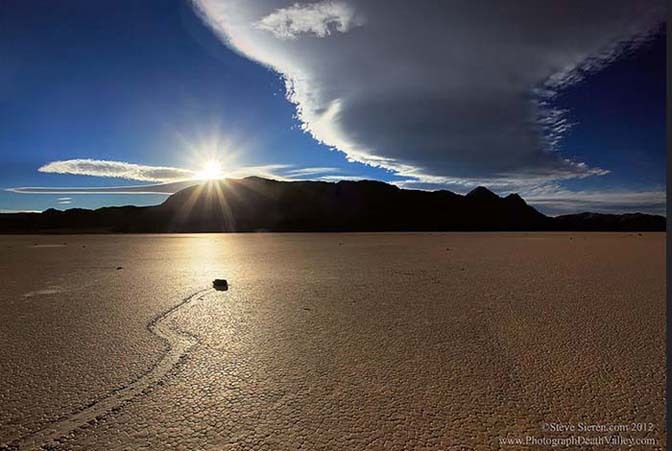 Sliding across the desert floor in Death Valley, this incredible phenomenon has puzzled scientists for decades. At long last scientists believe they’ve uncovered the secrets to why this has been happening. 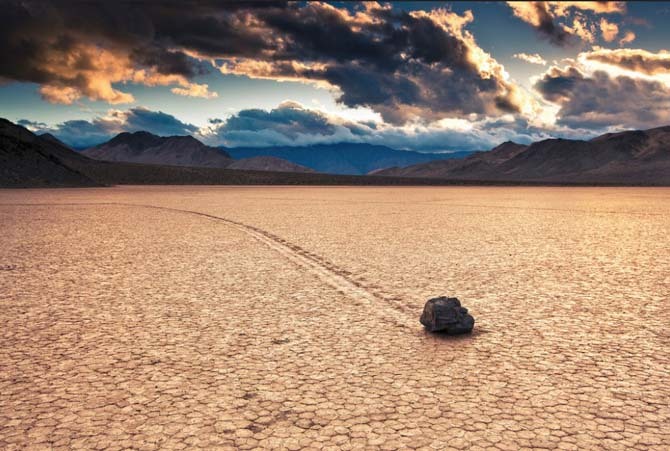 An article recently published by Weather Underground claims they have put to rest the mystery of the ‘Sliding Rocks’ of Racetrack Playa in Death Valley. Richard D. Norris and his cousin James M. Norris launched an investigation into the mystery beginning in 2011 with their ‘Slithering Stones Research Initiative’ sponsored by NASA and Scripps among others. 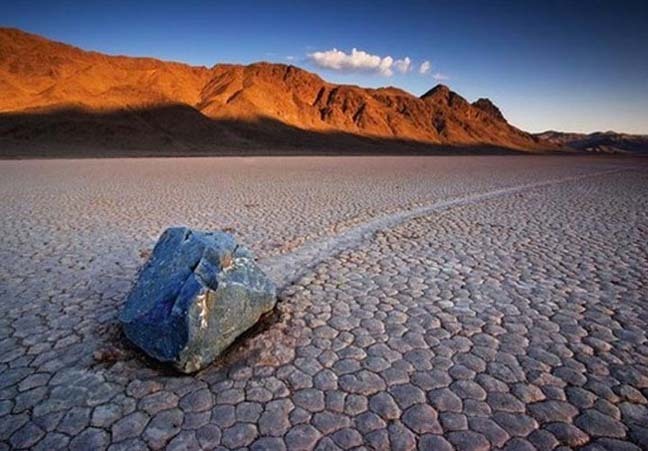 They established a weather station in the area near the playa and placed 15 stones attached with GPS tracking units in the vicinity of the existing ‘sliding stones’ that first triggered the mystery. 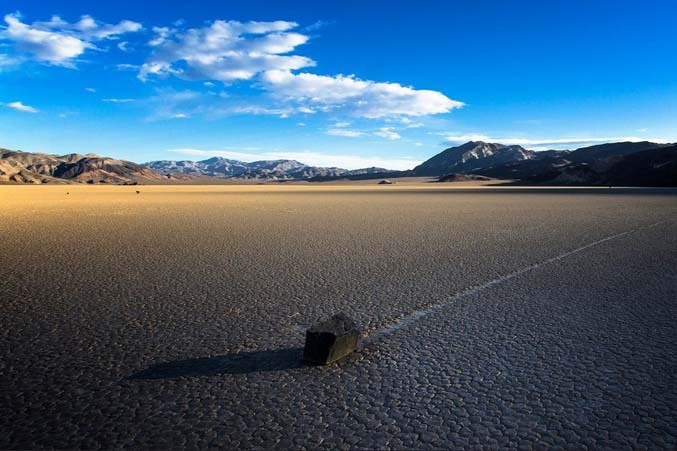 Using time-lapse photography researchers recorded the rocks sliding across the playa at the surprisingly fast pace of up to 15 feet (3-5 meters) per minute. Norris’s team explains what happened after the rainfall froze up underneath the rocks. “Steady light winds and morning sun caused floating ice to break-up near mid day, accompanied by widespread popping sounds from fragmenting ice panels. Ice initially broke into floating panels tens of meters in size that became increasingly fragmented and separated by open rippled water as melting continued,” said Norris. The two rocks that recorded movements had astounding results. The first travelled a distance of 65.6 metres, while the second travelled for 64.1 metres. Both movements lasted 16 minutes. Although this hypothesis has been made before (along with many others) this is the first time peer-reviewed proof of the phenomenon -and what causes it – has been confirmed by science. 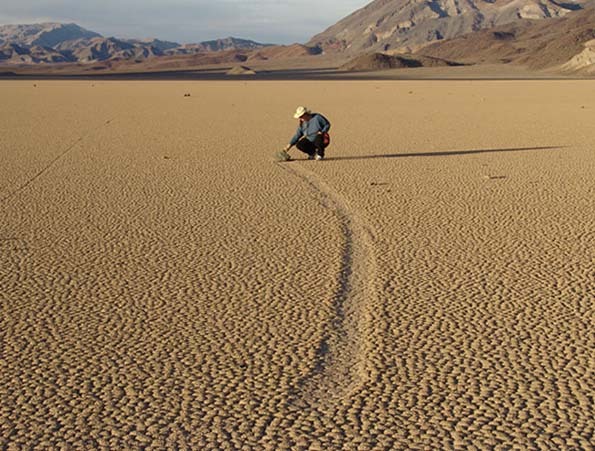 McCarran International Airport near Las Vegas is the closest commercial airport to Death Valley. There are also two small airstrips within the park for private plane access at Furnace Creek and Saline Springs. The nearest city with an train station is Barstow, which is served by the Southwest Chief Chicago to Los Angeles route.